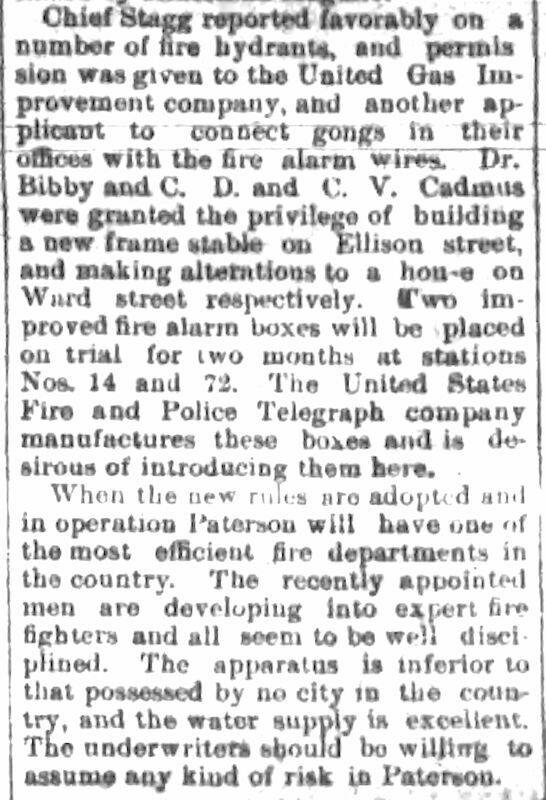 The paid Paterson Fire department had its origins in the mid 1880s. 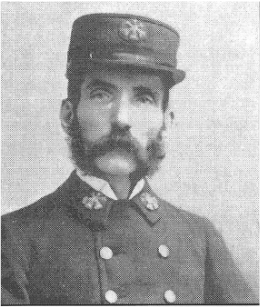 Several of the country's larger cities, including New York, had developed professional departments after the Civil War. 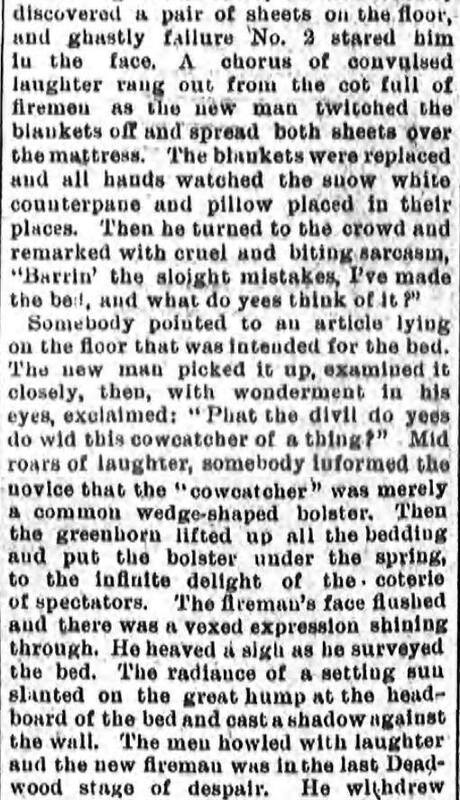 In Paterson, like many departments it was the horse that doomed the Volunteers. 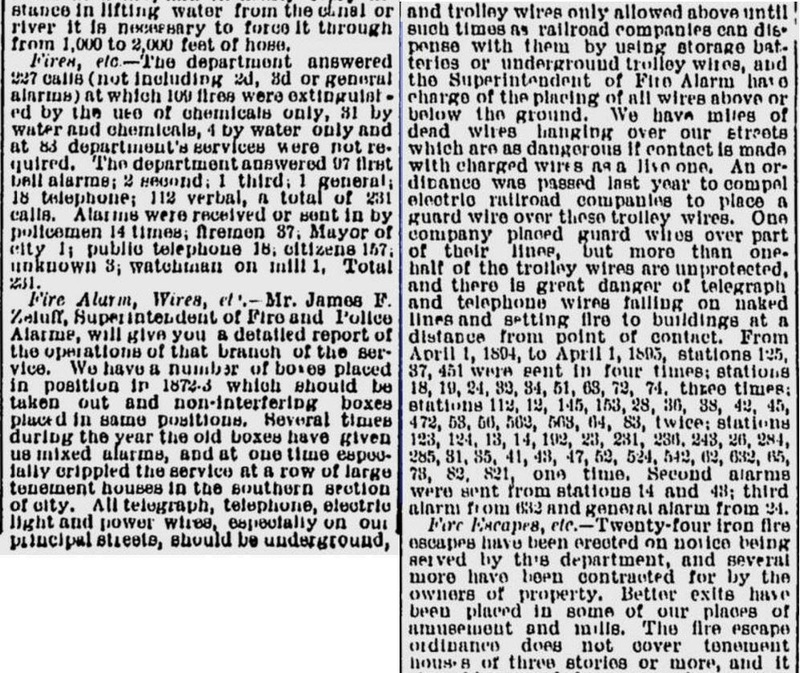 All of the apparatus used since the inception of the department in 1815 had been hand pulled by the firemen themselves. 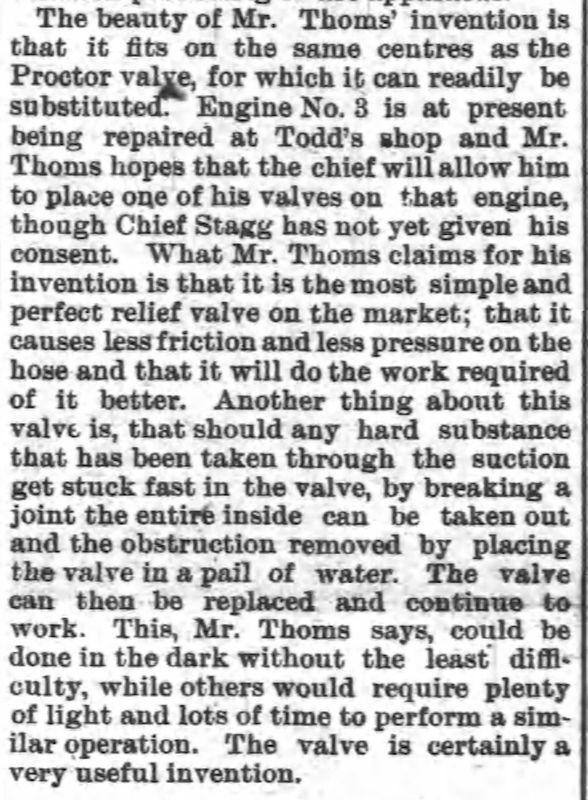 This was true even of the earlier (and smaller) steam fire engines that appeared in the 1860s. It could take as many as 20-40 men to pull the engines. However as technology progressed the apparatus (steamers and hook and ladder trucks) became significantly larger and horses were required to haul them. 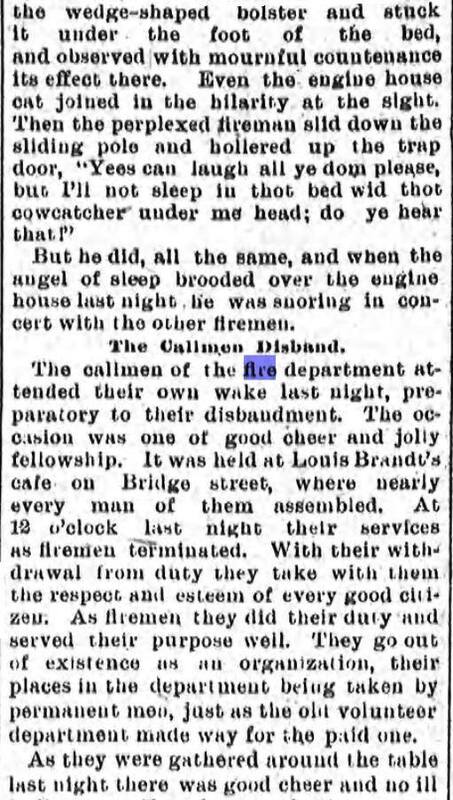 Once horses were introduced into the firehouses, it was necessary for someone to be with them 24 hours a day. 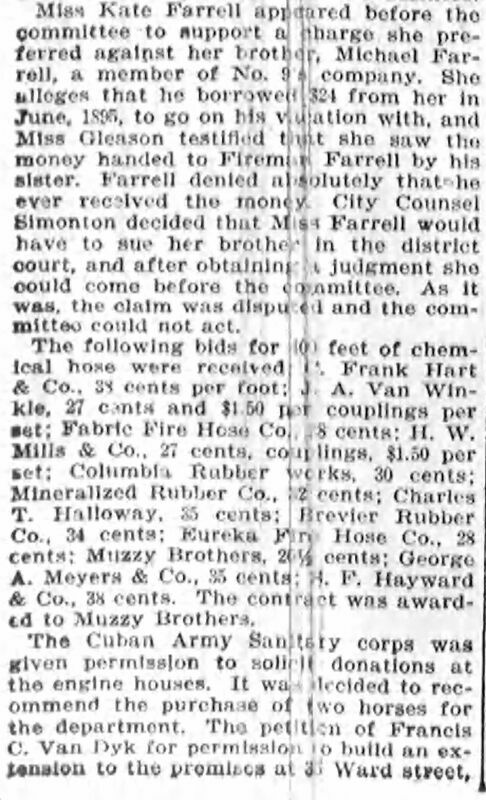 In reality the paid department began on May 1, 1884 when Passaic Steam Fire Engine Company 1, located at 112 Van Houten Street, introduced horses. 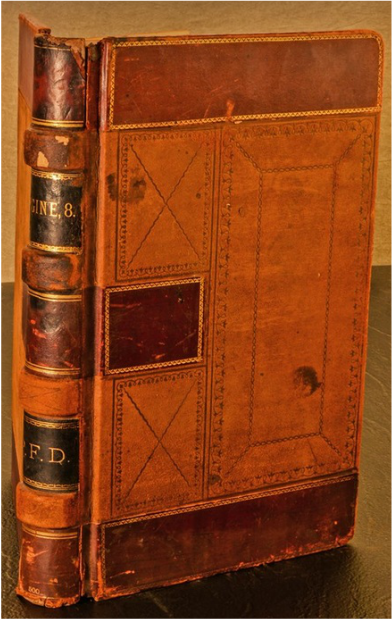 William Whittaker at a salary of $700 per annum was hired as the city's first "Driver." Over the next 5 years all of the other companies followed suit except for the three hose companies that were disbanded near the end of the decade. 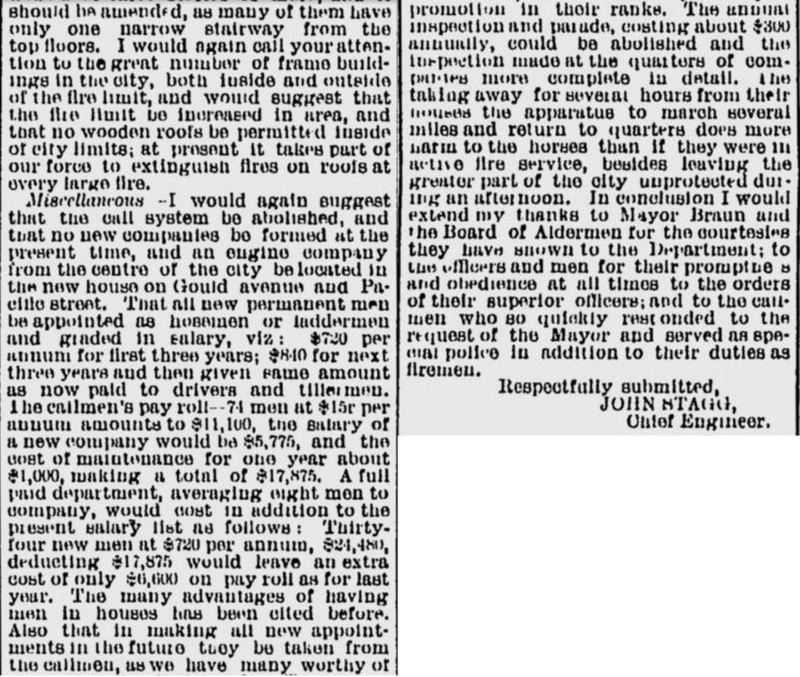 The city paid for the drivers and horses. 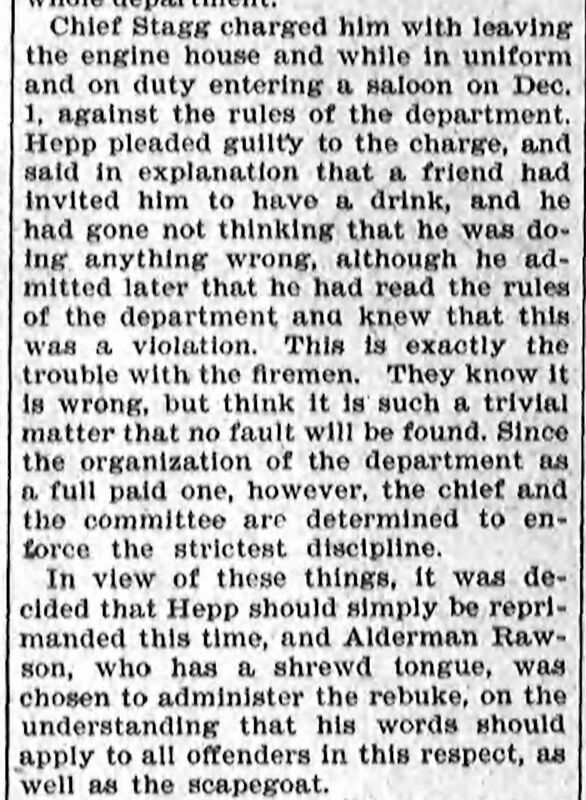 Of course the companies no longer needed as many men to pull the apparatus and hence the demise of the volunteer system began. The photos below illustrate the difference between a hand pulled steam fire engine and a horse pulled. 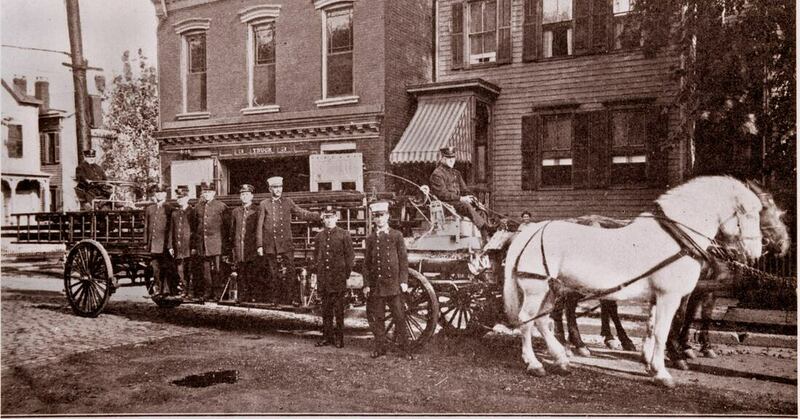 At left is the hand pulled single pump Banks steamer of Passaic Engine Company 1 (at its firehouse on Broadway) and the horse pulled Vigilant Engine Company 6, a third-class double pump steamer, built by the Paterson Steam Fire Engine Company. 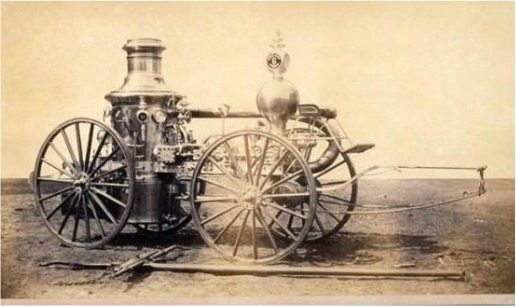 Note the driver's seat on the apparatus at right which is not needed on a hand pulled engine. 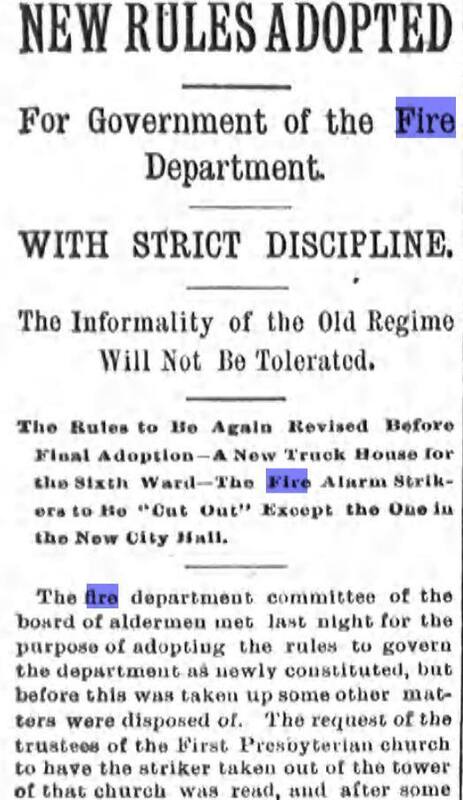 ​1888: The reorganization of the Fire Department by a special committee consisting of Aldermen MacDonald, Miller and Kearney was initiated. ​The first break was the disbanding of the three hose companies and the formation of a new Truck Company (No. 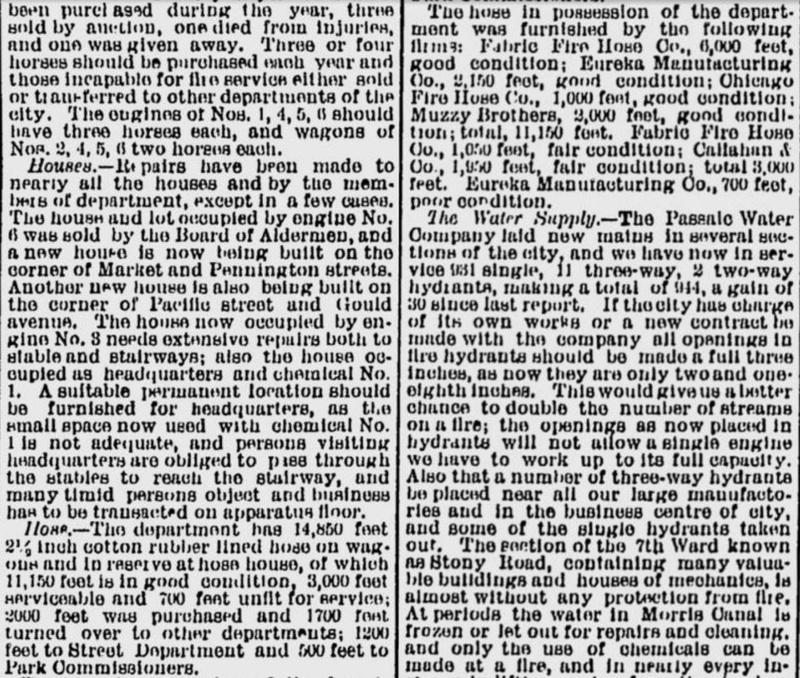 3) located in Godwin Ave quarters formerly used by Cataract Hose No 2. Many pathetic scenes took place in the various engine houses when the companies prepared for the final disbandment. Men who fought side by side against natures most destructive element "fire" were now severing ties that had bound them for years. 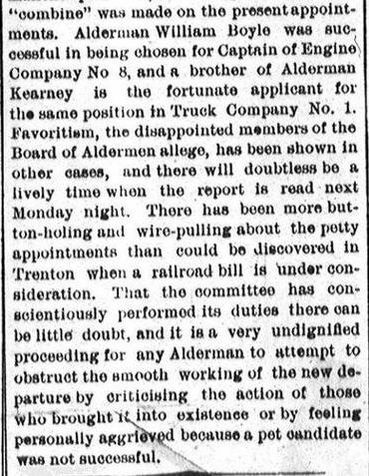 February 13, 1890: From the Paterson Weekly Press - Board of Alderman review qualification of initial appointments. 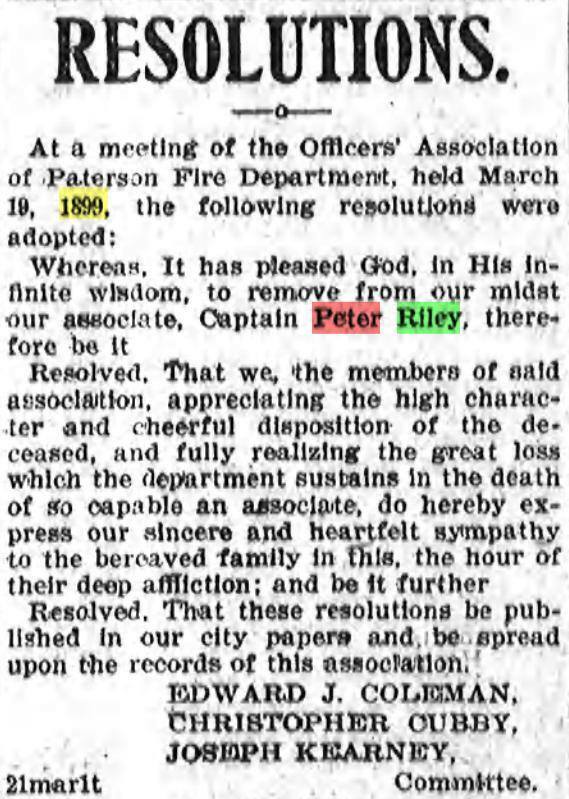 March 20, 1890: The Paterson Fire department was reorganized: partially paid department or "Call System" succeeded the volunteer system on with four permanent men in nine engine and three hook and ladder companies, and eight "call men" to each. 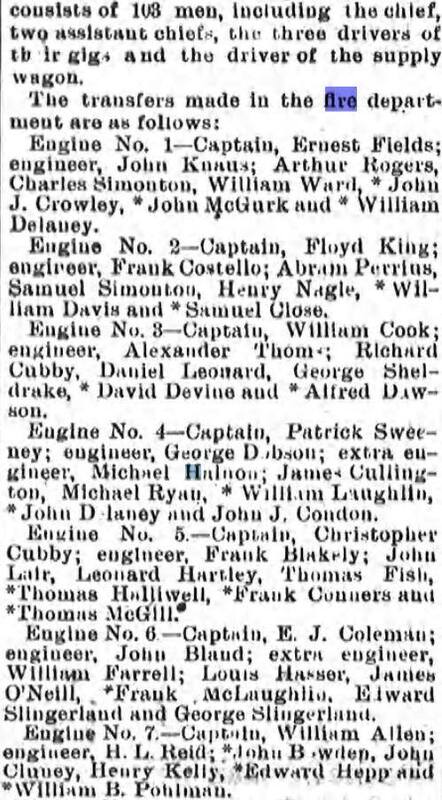 The fulltime men consisted of Captains, Engineers, Drivers and Tillermen as well as the chief, and two assistants and a Superintendent of Fire alarm Telegraph. ​​The men worked 24 hours a day, six days a week and each day got an hour off for breakfast, dinner (lunch) and supper. 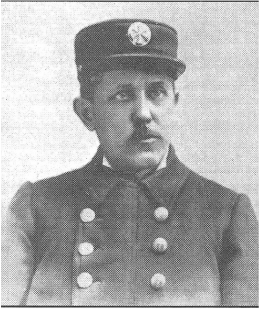 David Turnbull was the initial (albeit transient) Chief Engineer of the new department. 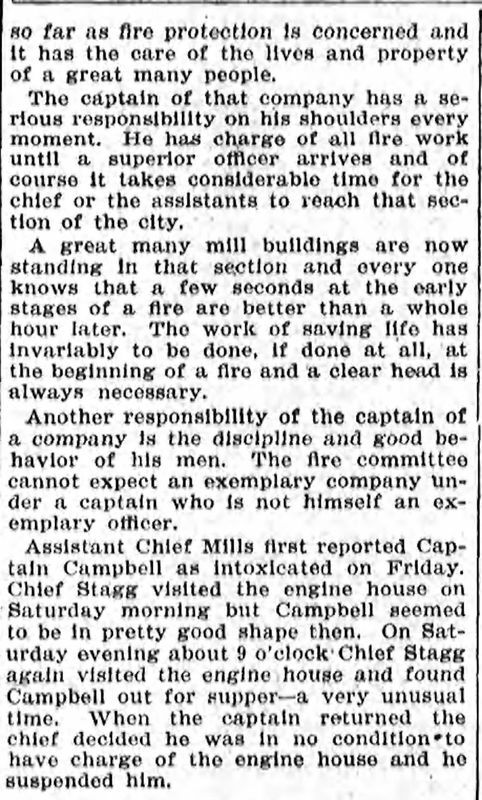 Below is a very early (March 22, 1890) Journal page from Engine Company 8 on Wayne Avenue - noting that Chief Turnbull visited quarters. 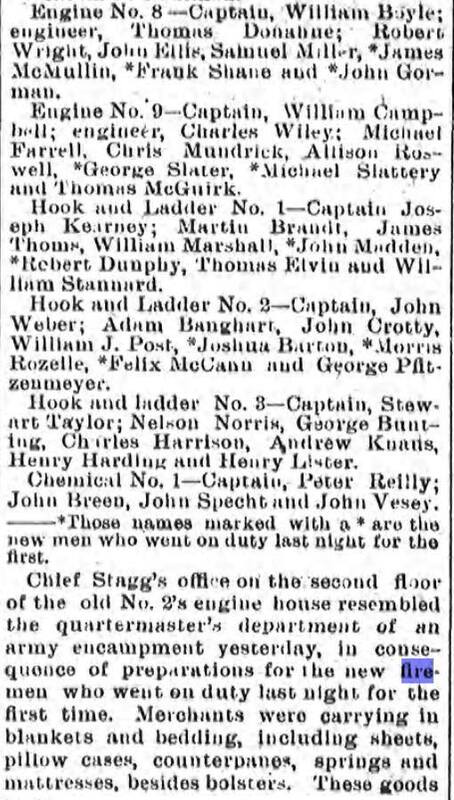 July 23, 1890: The paid department purchases its first new steam fire engines, a third size Silsby and assigned them to Engine Company 8 (seen below) and Engine Company 9. A new hose wagon also went to Engine 8. Finally a new three horse hitch went to Truck Co. 1. 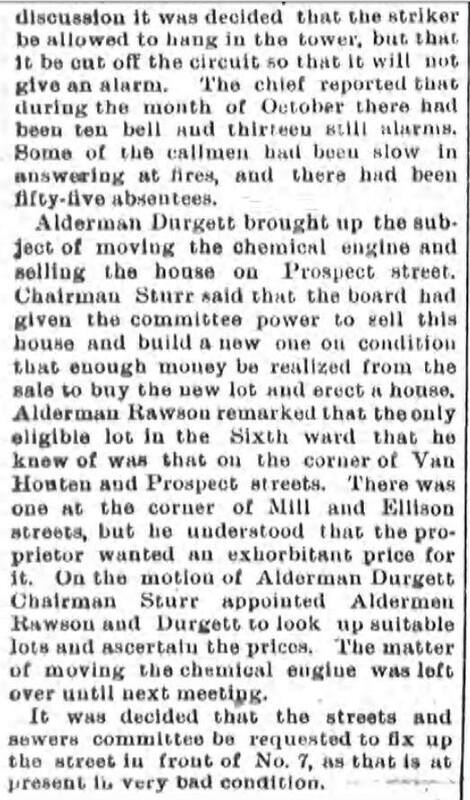 December 1, 1890: The department opens the first newly constructed firehouse in the paid era at 77 Highland Street and Engine Company 2, with Jeffer's steamer and hose wagon, relocates from Hotel Street. 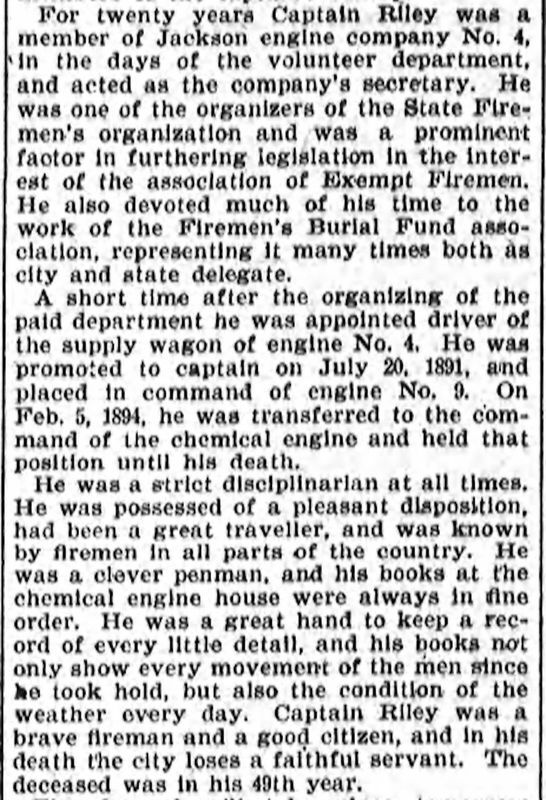 July 9, 1891: Call man James Moser of Engine Company 1 is killed by a soda water tank explosion. Since he was a call man and not paid, he was not originally listed on the Supreme Sacrifice Memorial Monument, but that omission was corrected in 2016. 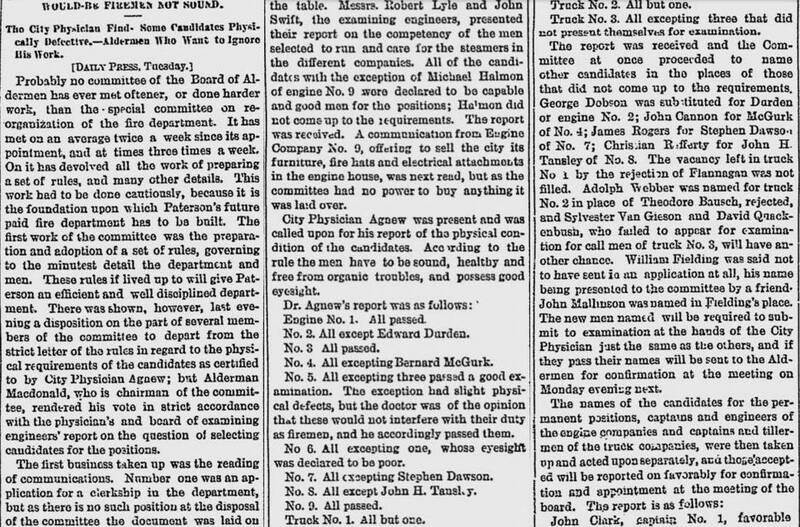 October 15, 1891: Statement from City Veterinary Surgeon (Wm. 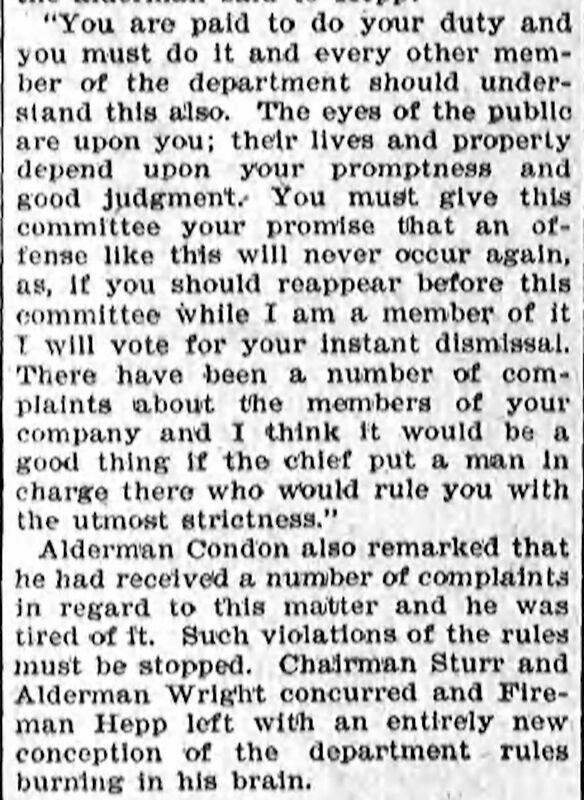 Herbert Lowe, DVS): The honorable board took a very important step in the right direction which will not only save money but will greatly improve the efficiency of several departments of the city that require horses -- Hereafter in the purchase of horses for the Fire department of the city, the same be by sealed proposals, said horses to be from 1200 to 1325 pounds; about 16 hands high, not to be over 6 years of age, to be given 30 days trial and to be examined by the City Veterinary Surgeon as to soundness and adaptability before purchasing the same. 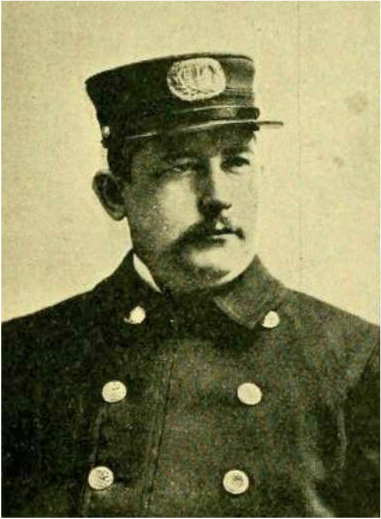 December 6, 1891: Richard Duffy of Truck Company 1 is thrown from apparatus and died the next day after leg surgery. Since he was a callman and not paid, he was not listed on the current Supreme Sacrifice Monument until 2016. 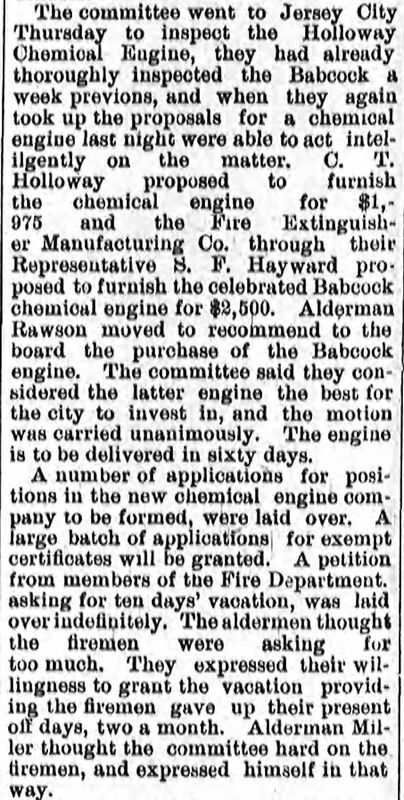 ​March 1893: A new combination chemical and ladder truck is purchased and assigned to Truck Company 3 on Godwin Ave.
May 5, 1893: Christopher Murphy of Truck Company 3, fatally injured falling off the apparatus. Since he was a callman and not paid, he was not listed on the current Supreme Sacrifice Monument until 2016. 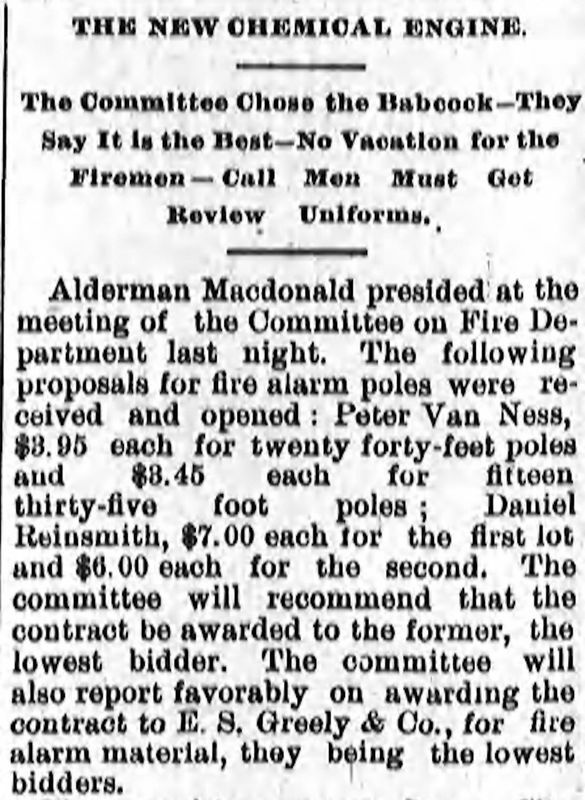 December 14, 1893: At an alderman meeting the age and height of firemen are discussed. 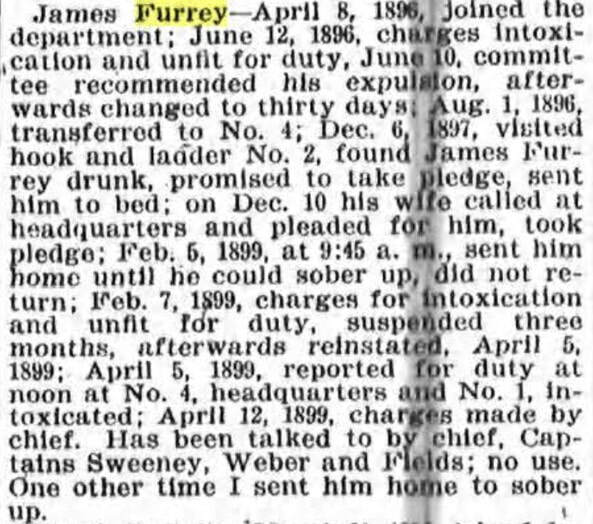 1894: The "call system" did not meet the satisfaction owing to the habit of the callmen failing to report in more cases than they were supposed to. 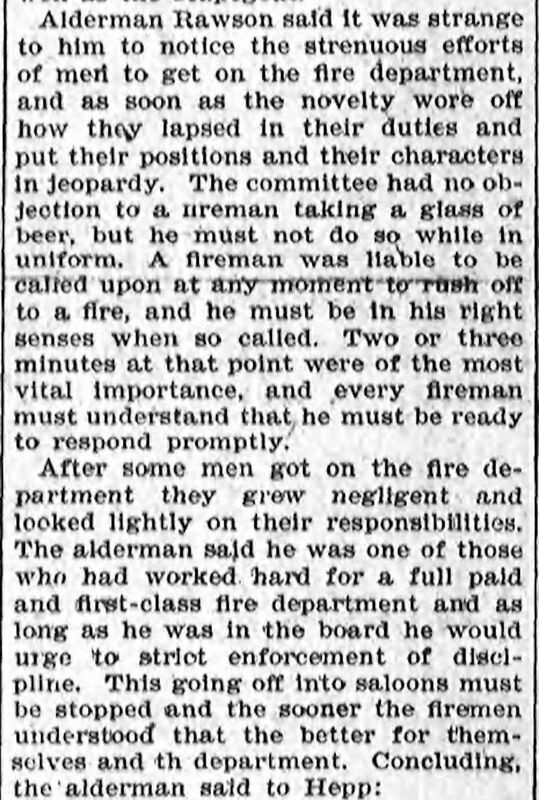 It got to be the rule that the only men at fires were those who were regularly employed for such work. ​During 1894 the department had 45 horses in service. 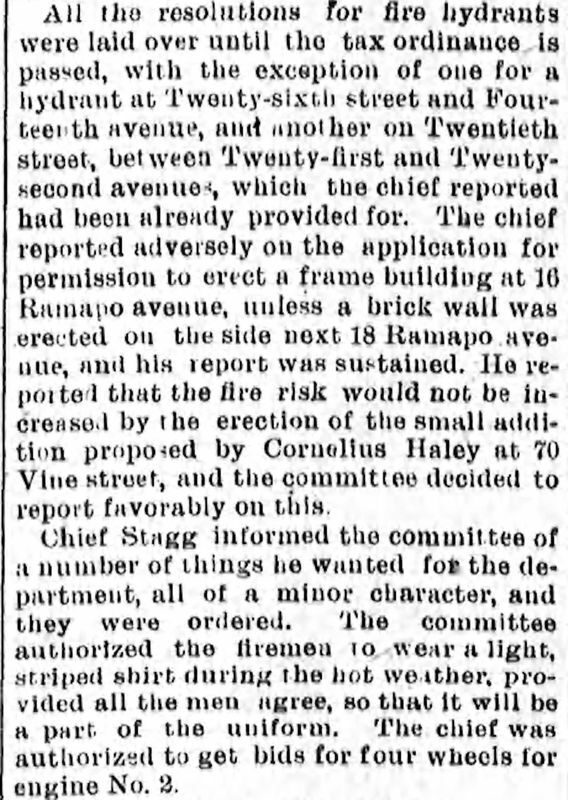 1894: Hotel Street name is renamed Hamilton Street - The Firehouse at 10 Hotel Street becomes 10 Hamilton Street. 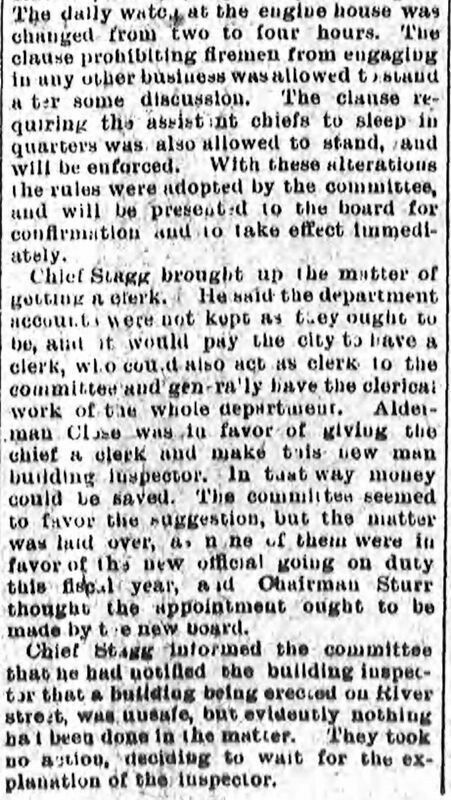 April 3, 1895: Chief Stagg issues report about going to fully paid fire department and elimination of the callmen. 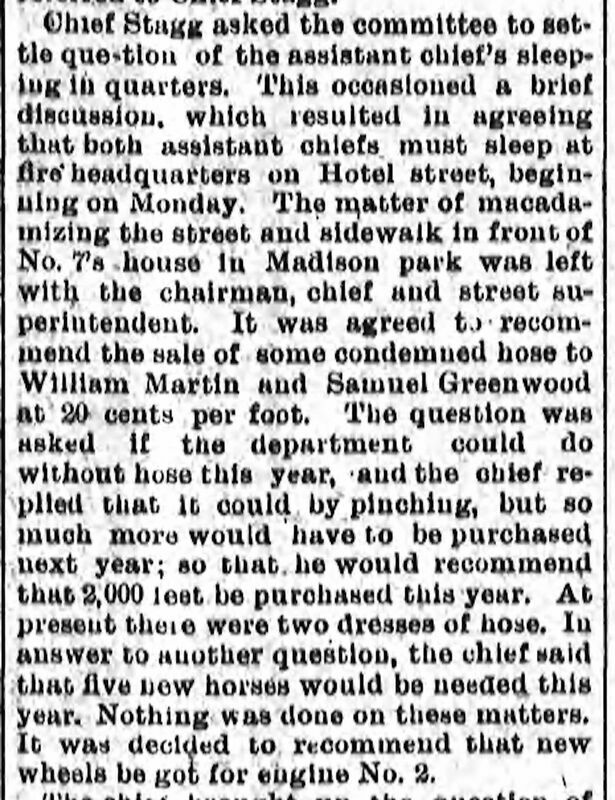 Interesting comment that fire headquarters, then located at the Hotel Street Firehouse should be moved because to access the Chief's office (described as too small) on the second floor, visitors have to walk through the stables to get to the staircase. It is noted that "timid" visitors object to this! 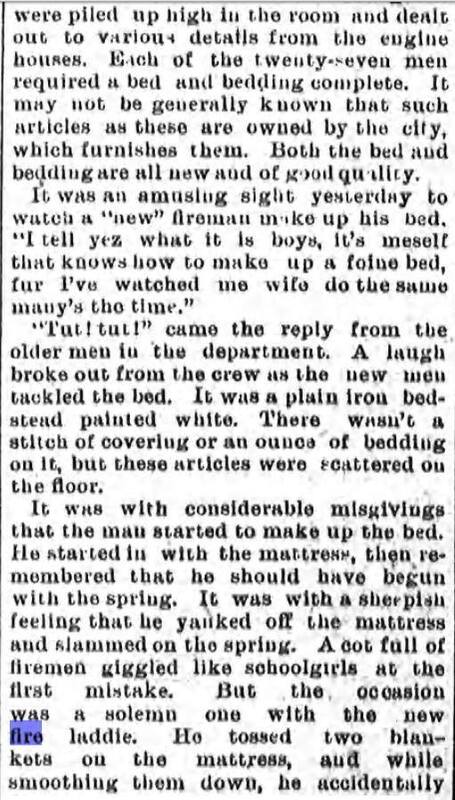 September 24, 1895: Engine Company 7 moves from the Tyler Street Firehouse to a new quarters at 78 Gould Avenue (corner of Pacific Street). Engine Company 3 moves from 77 Prospect Street quarters to the Tyler Street Firehouse just vacated by Engine Company 7. 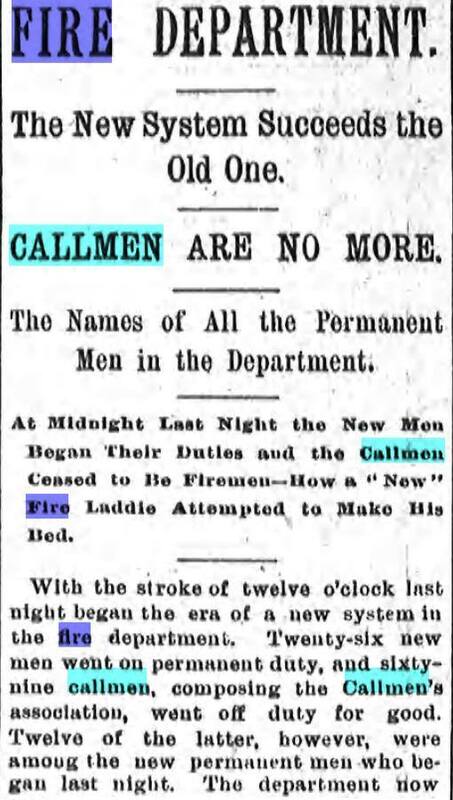 November 15, 1895: The department becomes fully paid as all callmen are replaced by full time firemen who had to live in the firehouses. In actuality many of the existing callmen were hired. 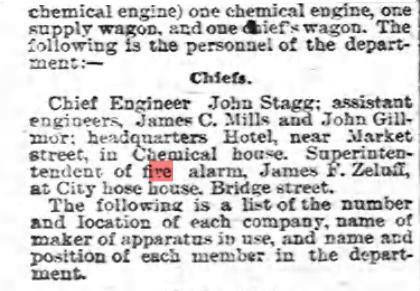 The department consisted of one Chief Engineer (John Stagg), two assistant chiefs Jsmes C. Mills and John Gilmore), thirteen captains, eleven engineers of steam fire engines, seventy one drivers, hosemen and ladderman, one superintendent of fire alarm (James F. Zeluff) and two linemen. 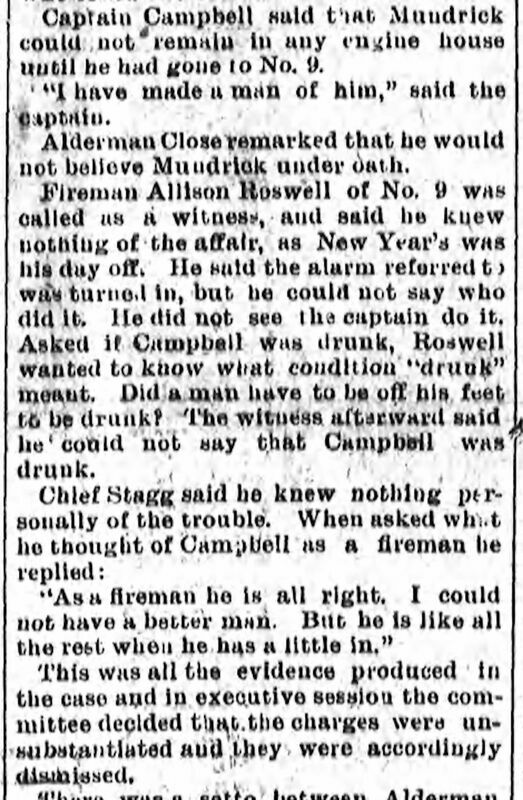 The fireman worked 24 hours a day (with an hour off for breakfast lunch and supper) six days per week. They had one day off per week. 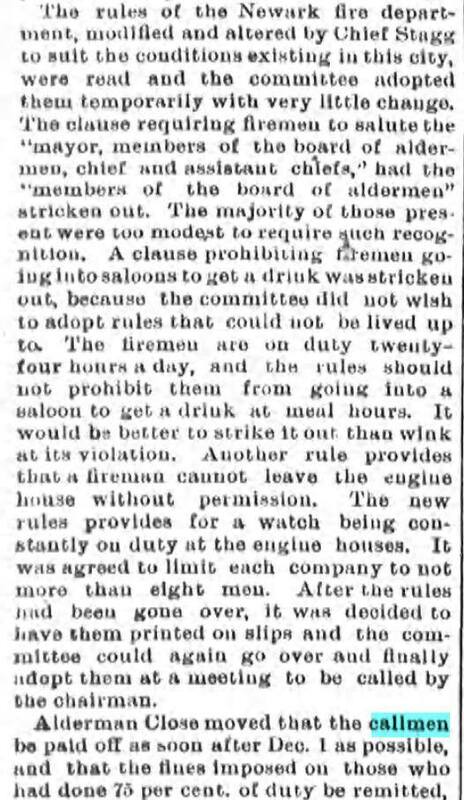 May 11, 1896: The first General Alarm in the history of the fully paid Paterson Fire department occurred on at Hinchliffe brewery on Ann Street. 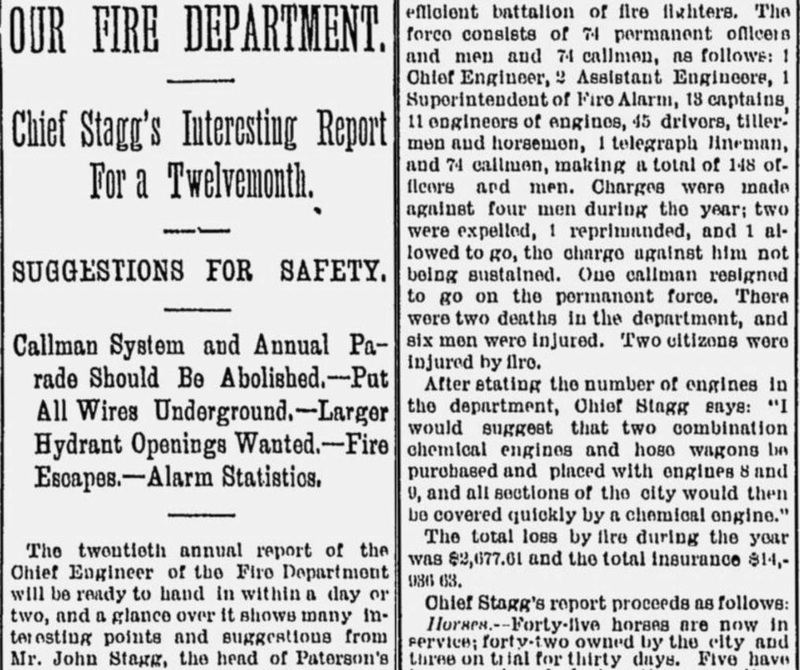 ​March 31, 1897: Chief Stagg annual report notes there are no reserve engines and during the preceding year PFD"was crippled" for 71 days when apparatus were off duty for repairs. One old steamer (called useless) is at the hose house on Bridge Street. 44 horses are in use and 5 more are needed immediately. Wants the office of lieutenant to ne initiated as sometimes, in the absence of the captain, the "acting" captain is not given full respect. 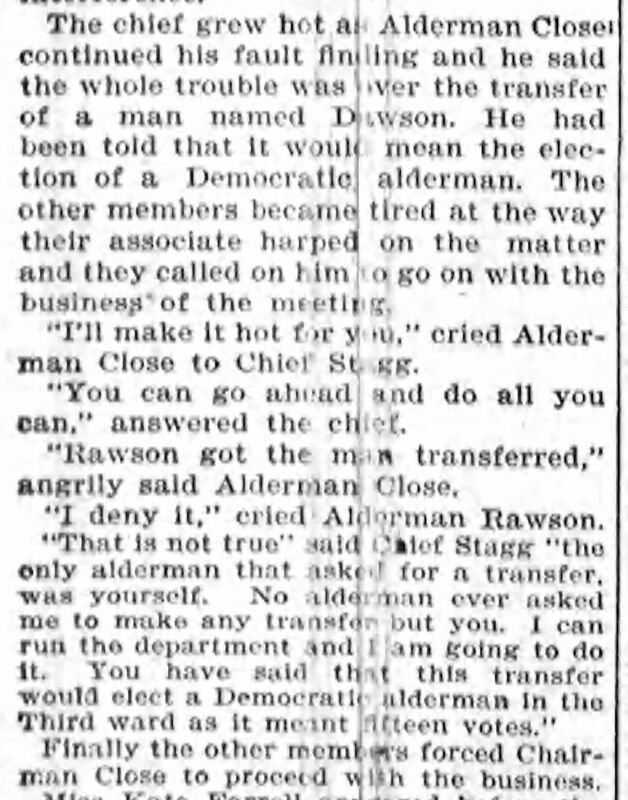 Requests that the department headquarters office be relocated to the new City Hall. 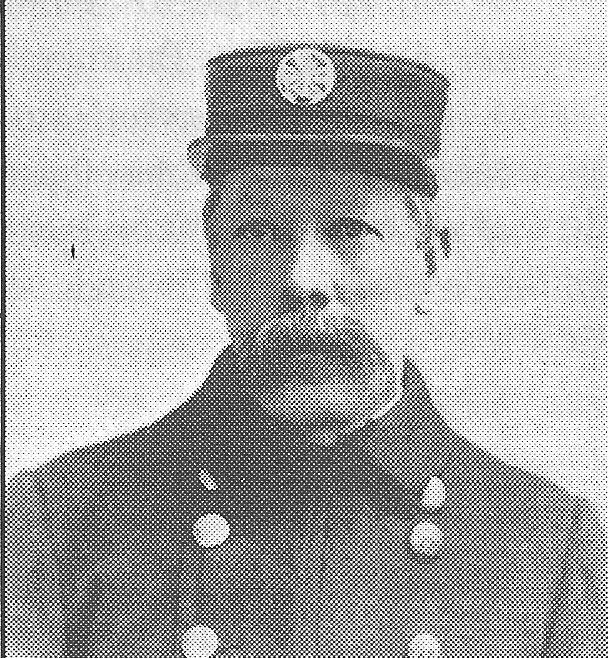 ​1898: Tyler Street east of the Erie Railroad is renamed as Twelfth Avenue and the address of the Firehouse of Engine Company 3 changes from 298 Tyler Street to 112 Twelfth Avenue. 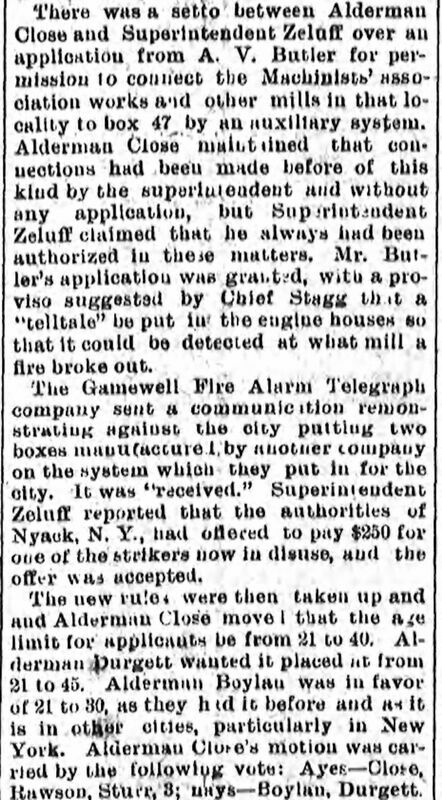 April 1, 1899: Chief Stagg recommends removal of the fire alarm system to City Hall and advises that all fire alarm boxes be furnished with keyless doors or key guards enabling any person to send in an alarm without hunting for a key. 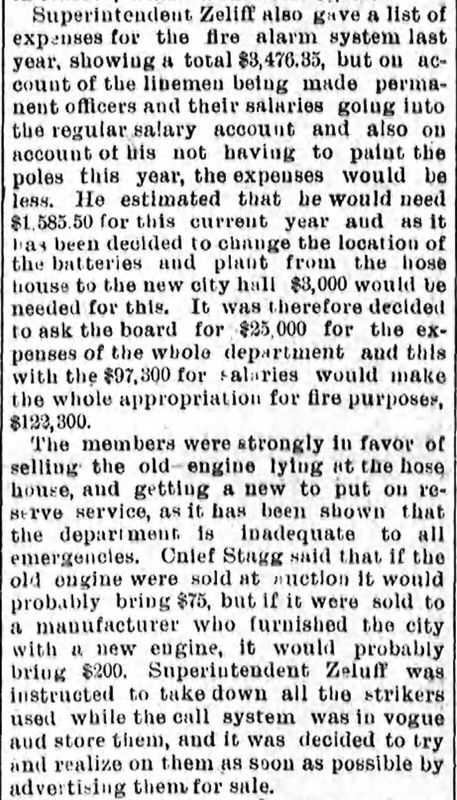 November 1, 1899: National Board of Fire Examiners inspects the department and recommended 2500 feet of first class hose, replacement of the old hook and ladder truck, that all companies have at least eight men and a building inspection program be started. 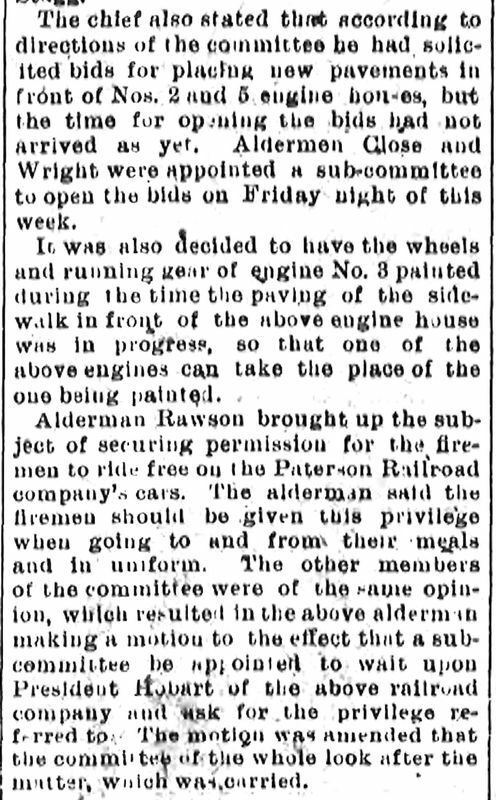 November 29, 1899: Paterson firefighters wielding axes and saws worked with police to free passengers from wreck of the Buffalo Express at the Van Winkle Street rail crossing. A train bound for Hoboken sped through a signal and crashed into the express as it waited near the Delaware, Lackawanna and Western Railroad station - killing six people and injuring 21 others. 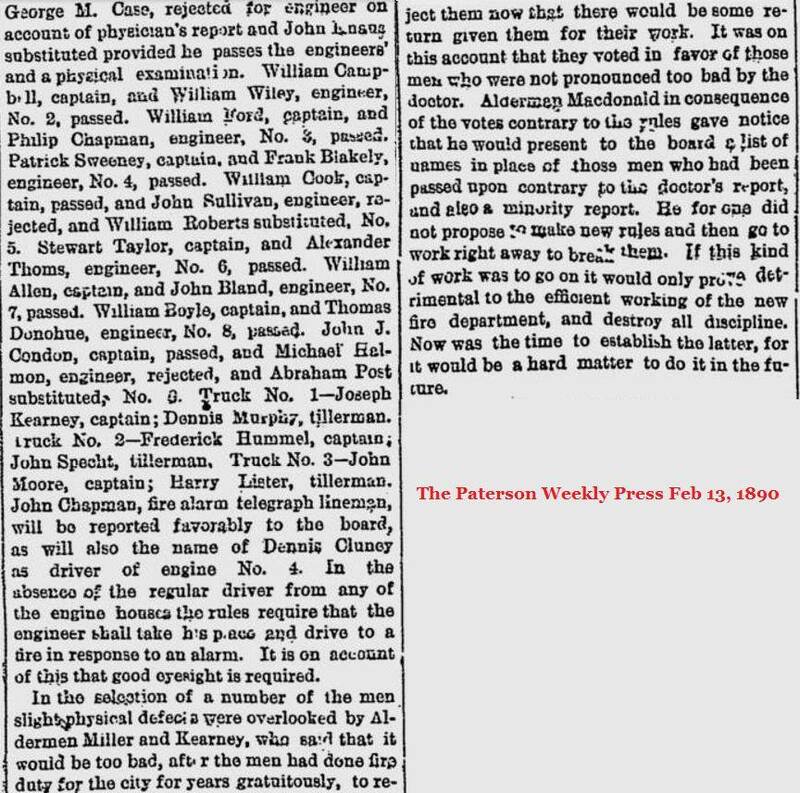 This is the worse train accident in Paterson's history.